Carlton Draught is one of Australia’s biggest selling tap beers, thanks to connoisseurs who appreciate the smooth, refreshing flavour of a traditionally brewed, full strength lager. Carlton Draught is brewed with sun-ripened Australian barley malt, which contributes to its distinctive smoothness, then it’s hopped with Carlton’s own special ‘Pride’ variety of hops for an emphatic edge. Cool-fermented with Carlton’s unique pure culture yeast for an easy-drinking palate, Carlton Draught has a true refreshing after-taste. 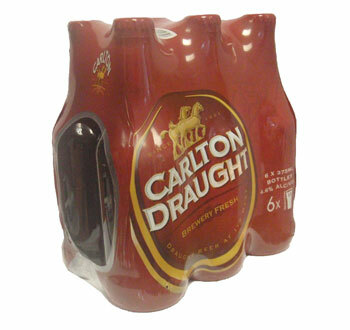 Carlton Draught can put out the fires of a chilli-hot dish or perfectly complement your favourite pub meal. Was in Australia for my 1st time in April 2018, this was my 1st beer to try and it is great, tastes better than any beer I have tried back home in Britain. Until next time back in Australia, I will carry on ordering Carlton Draught. Australia, just the best country in the world, but i feared the worst when i first went there, thinking the lager must be crap.. but no, even the beer is better than the UK !!... Great beer, and thank you sanza for bringing it over to us!! Thats all I drink when in aus. Cannot get it over here except from sanza, well pleased to have found your site. Ive been drinking beer since I was 15....tried pretty much everything......went to Oz 2 years ago and had Carlton Draught..best beer I've ever tasted......and I'm a Brit. After 18 months of sucking down pint after pint of limp wristed English "beer." The taste-buds water at the thought of an ice cold Carlton Draught.